Snooker player Cliff Thorburn at work. As I mentioned two weeks ago, my I’ve been very busy doing some freelance work for Canada’s Sports Hall of Fame. The past two weeks have been spent researching and selecting the top two or three defining moments in the lives of 96 honoured members of the Hall. Along the way I’ve learned a lot of quirky and interesting facts about some of Canada’s greatest athletes. 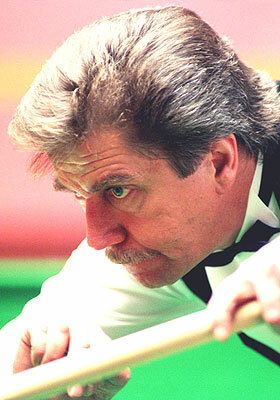 Snooker master Cliff Thorburn was the first person in world championship history to record a perfect break of 147. For those of you who’ve never played snooker: a perfect score of 147 means that he sank every cherry ball on the table and was able to follow up with the black ball (the most valuable of the coloured balls) every time. Further, he did it without his opponent ever sinking a single ball. It’s an incredible feat of strategy, foresight and skill at any level, let alone in a world championship. Unfortunately, Thorburn went on to lose the final match of the tournament to Steve Davis, but that doesn’t diminish his accomplishment in the first round against Terry Griffiths. Famed strongman Louis Cyr’s records are hard to verify since few were recorded and most were hyped and exaggerated by promoters. However, he definitely set a record in 1895 by lifting 4,337 pounds on his back. As impressive as that is, the story that struck me was that at the age of 18 Cyr won a strongman competition in Boston by lifting a horse off the ground. Don’t get me wrong, no horse weighs as much as 4,337 pounds, but they do, you know, move around and squirm. Particularly if they’re uncomfortable, like if someone was picking them up off the ground. Trying to lift something as heavy as a horse while it is moving is way more impressive than a dead lift, no matter the disparity in weight. Finally, as many hockey fans know, Henri Richard holds the record for most Stanley Cup wins as a player. His 11 championship rings is a mark that may never be passed with the salary cap-era of the National Hockey League in full effect. What most people don’t know is that at the time of Richard’s retirement he had won more Stanley Cups than he had had birthdays. Since he was born on February 29th, 1936 – a leap year – he had only celebrated his actual birthday nine times before his retirement during the 1974-75 season. Anyway, thought I’d just drop some knowledge. I should have time to do some more posting as the week continues.